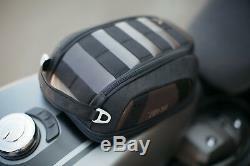 SW Motech Legend LT1 Tank Bag. Powerful magnets provide secure mounting for the SW Motech Legend LT1 tank bag even on rough roads. 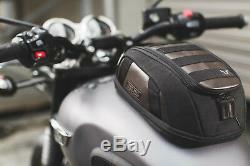 Due to its base the Legend Gear LT1 tank bag can be easily removed. Dimensions: 18 x 12 x 25 cm. 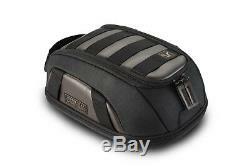 Specification for SW Motech Legend LT1 Tank Bag. Fitting most steel gas tanks Anti-skid bottom Zippered capacity expansion Front cable feed-through Robust carrying handle Rain protection by splash-proof material and waterproof raincover with clear PVC window Military grade fastening system for Legend Gear LA1 and LA2 accessory bags and Legend Gear LA3 smartphone bag (optional accessory) Material: Napalon synthetic leather and coated canvas, splash-proof PU inner lining. Waterproof rain cover made of 210D polyamide, double PU lining, window made of 0.2 mm PVC foil. 3 - 5.5 litre capcity. X1 rain cover with window x4 straps (for mounting on non-magnetic gas tanks). WE ARE AN AUTHORISED SW MOTECH DEALER. 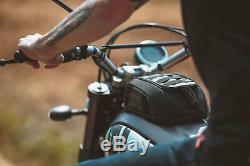 ABOUT US Welcome to Hermod, your number one shop for all things motorcycle. We are a family run business with over 45 years experience and were dedicated to giving our customers the very best of motorcycle apparel, luggage, accessories and parts, with a focus on quality, service and uniqueness. We hope you enjoy our products as much as we enjoy offering them to you. If you wish to visit our showroom for a specific product, please call beforehand to check stock prior to leaving to avoid any disappointment. We understand that from time to time you may wish to return a product to us. Please make sure the item has been correctly packaged with outer packaging like how it was received. The item "SW Motech Legend LT1 Motorcycle Tank Bag Black/Brown" is in sale since Thursday, December 14, 2017.